While the rest of the world is obsessed with Facebook's IPO, I thought I might be a contrarian and focus on Google+. At times, I have felt as if Google and others share G+ data and analysis not to enlighten but to convince. When Vic Gundotra, Google’s vice president for engineering, says that Google+ has 100 million monthly active users (or MAUs) compared to Facebook's 901 million MAUs, I find myself wanting to see the data and dig into methodology, because assertions such as this do not always meet my "gut check." Google+ data seems to come in one of two flavors--either statistics that support the Google-Plus-is-a-ghost-town argument or figures that lead to headlines such as "Google+ brand pages seeing adoption, engagement growth." The truth is certainly somewhere in between, but I have to say the more sober numbers and analysis seem to have a greater ring of truth. 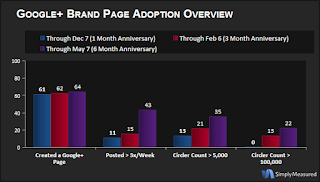 64% of the Interbrand Top 100 now have an active Google+ Brand page. 22% of the brands now have circler counts over 100,000, up from 13%. More brands are posting more frequently: 43% are posting over 3X a week (up from 15% in February). The folks behind the study offer services to help brands evaluate and improve their Google+ brand presence, which means they have a horse in the race. That does not mean their data is inaccurate, of course--in fact, I am sure the data is factual--but are the analysis and findings complete and thorough? Do conclusions such as these help marketers and social professionals evaluate the importance of G+, or do they subtly encourage brand adoption of G+ (and, by extension, adoption of the study sponsor's services)? * Coke's Facebook page didn't seem to be working like other Facebook pages when I tested it. I had great difficulties getting older posts to load, so I'm not certain this is an accurate number. In order to compare the number of fans/circlers and likes/+1s on an apples-to-apples basis, I computed averages based only on the brands that are actively maintaining a presence in both social networks. I have noted the current averages in the chart below. Fifty percent of the world's top ten brands are absent from Google+, while nine are present on Facebook. Apple is the lone holdout on both platforms. Perhaps most telling is this: Google gets substantially greater engagement with its brand page on Facebook than its brand page on its own social network. Despite posting significantly more content to G+, Google's Facebook presence has 1500% more connections to consumers and its posts receive almost 500% more engagement on Facebook than G+. An RJMetrics analysis found that the average post on Google Plus receives just 0.77 +1s, 0.54 replies and 0.17 reshares. The same study found that 30 percent of users who make a public post on G+ never make another. Even after making five public posts, there is still a 15% dropoff before the sixth post. A Nielsen study found that over 70% of US moms who went online in March visited Facebook. The study also lists percentages for Blogger, Twitter, Wordpress and Tumblr, but the study omits Google+. It is hard to imagine that if moms were visiting G+ in any significant numbers that Nielsen would have excluded Google+ from this study. Janrain reported that Facebook is approaching 50% penetration among social login services. As recently as 18 months ago, Google held a tremendous advantage as the social login of choice among consumers, but today 45% of consumers use their Facebook accounts to log into third-party sites and only 30% use their Google credentials to do so. A recent Pew Internet study found that 73% of search users said they would not be okay with a search engine keeping track of their searches and using that information to personalize future search results because they feel it is an invasion of privacy. The idea of search as a social signal is a core tenet of Google's social strategy, but it seems few consumers are comfortable with the concept. Experian Hitwise recently tweeted that G+ experienced traffic growth of 5% from March to April 2012, which sounds pretty impressive until you consider the same company reported 27% traffic growth from February to March and a 55% month-to-month growth rate in late 2011. It seems G+'s adoption is decelerating rapidly less than a year after its September 2011 launch. I am not trying to pile on Google Plus, but I would like more transparency from Google and others when it comes to data about G+ usage, engagement and growth. As a social media leader at a Fortune 500 firm, I must evaluate the benefits of dedicating resources to maintain a presence on Google Plus, and I would like to be armed with real data to make the right decision. For now, our choice about Google+ is informed by the fact that our brand has a mere 230 +1s on G+ , 0.1% of our total fan count on Facebook. Perhaps Google+ will someday succeed at becoming a major social network, social layer, or whatever other social strategy Google chooses to pursue. For now, it seems to remain a niche social network with little engagement and stagnating growth. I am happy to proven wrong, but it is going to take thorough, accurate and transparent G+ data to do so--something in short supply at the current time. As a former agency leader, I find it fascinating to observe and learn from the ways agencies foster their own brands. After all, agencies exist to manage clients' brands, so they ought to bring the full force of their knowledge and experience to maximizing their own brands. Alas, like the fabled cobbler's children, agencies often don't do a very good job of dedicating resources to managing their own brands. This is why I took notice when IMC2 announced a name change to MEplusYOU. I had the opportunity to speak with agency leaders about the reasons for the change. The journey IMC2 took to become MEplusYOU speaks not only of the passion and vision of the agency leaders, but also of the changes occurring to marketing in the age of the digital, mobile and social consumer. I have had the good fortune to know Ian Wolfman, CMO, and Doug Levy, CEO, of IMC2 for some time. I first became acquainted with the agency's work while I was at Forrester covering interactive marketing, and several of its programs made their way as case studies into my reports. IMC2 impressed me with the way its work engaged emotions and delivered results. 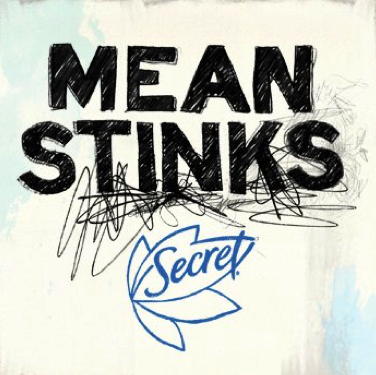 A favorite IMC2 example that I've often shared (and was included in my report, The ROI of Social Media Marketing) is the program for P&G's Secret deodorant. You can imagine the challenge encouraging consumers to "friend" their underarm deodorant, but IMC2 brought a sense of meaning to the brand with “Let Her Jump,” a petition to let Lindsey Van and other female ski jumpers compete in the 2014 Winter Olympics. I dare you to watch the evocative video and not get choked up. The program engaged emotions, drew consumers to friend the Secret brand on Facebook and delivered a significant and measurable increase in purchase intent. IMC2 has a solid reputation built from years of successful client work. So, why change the name of the agency and risk confusion in the marketplace? I had a conversation with Levy about the reasons behind the rebranding to MEplusYOU. Levy insists the name change merely reflects the work the agency is already doing, and he points to the ebook, Winning in the Relationship Era: a New Model for Marketing Success that the agency first published two years ago. The free book (which is a very brief and worthwhile read) conveys IMC2's view that the product and consumer eras have given way to a new Relationship Era. Levy wrote in Winning in the Relationship Era that "The brand must know its authentic self before it can engage in sustainable relationships with people" and the starting point for brands was to be "clear on their purpose, the reason for the brand’s existence." According to Levy, one of the factors in the transition from the consumer era to the Relationship Era is the disintegration of mass media. I probed if Levy really believe mass marketing was dying, and his answer was interesting and paradoxical. "Mass marketing is definitely dying, and at the same time traditional paid media can be very effective for marketers." Levy explains: "First, there is no doubt that mass is dying. Forty years ago, marketers were able to reach a sizable portion of the population with a single TV spot on a major network. Now, blanketing all of the major networks reaches a fraction of those eyeballs, and 40% of the people on the receiving end of TV ads have DVRs that they can use to speed through the commercials. Attention is split among thousands of cable channels, Hulu, Netflix, X-Box, YouTube. Magazine ad revenue has dropped $5 billion since 2007. Young people are choosing digital music over radio. And, only a tiny fraction of Web sites are able to charge for ad space. In every mass channel, mass is giving way to fragmentation. "Yet, marketers can and do benefit from paid media. It can complement other aspects of marketing and help brands reach people where they hang out. We recommend an approach to marketing that is built on a combination of paid, owned, shared, and hopefully earned media. Paid plays a role. In today’s increasingly complex marketing landscape, it’s just not the whole shebang." Levy foresees that successful marketing will look and feel different than what consumers, brands and agencies have experienced over the last several decades. "The shift to a Relationship Era approach suggests a decreasing reliance on the traditional use of mass media to influence and persuade a passive audience to buy more of whatever the marketer is trying to sell. Relationship Era marketers embrace approaches that build stronger relationships between their brands and people." Campaigns have been the building block of marketing for decades, and I was curious how MEplusYOU believed episodic marketing might change in the Relationship Era. "We tend to think less about campaigns that end and more about cultivating never-ending communities of like-minded people. When communities are in place, we plan ‘ignitions’ to activate the community in areas of shared interest." I asked Levy if he thought every brand would need to embrace the Relationship Era or if some brands might differentiate on other attributes, such as price or convenience. "Differentiation has more to do with how a brand acts and what it does," notes Levy, but he contends the Relationship Era is about purpose. "Purpose has to do with why a brand exists. Brands that are clear on their purpose and act upon that purpose have more engaged employees, more loyal customers, and healthier financial results than others, according to a variety of data sources. The most successful brands deliver exceptional products and services that are proof of their why." Says Levy, differentiation without purpose creates unsustainable brands. "A brand could certainly differentiate in a purposeful way based on being cheaper or faster than their competition. When competitive advantages such as those are born out of a heartfelt understanding of why the brand exists, the competitive advantages are much more sustainable than the one-upsmanship of more typical marketing." IMC2 has been delivering programs that "foster deeper and more purposeful interaction and build more enduring connections" between clients' brands and their consumers. This is the reason for the change to the new name. Levy wants marketers to recognize that MEplusYOU delivers a different sort of marketing for a different era--"something that is ultimately as meaningful as it is effective, building both trust and transactions that help brands endure and thrive. In many ways, the re-launch of the agency allows our name and public persona to catch up with where we are." Taking a page out of his own book (literally), Levy felt his agency needed a name that reflected its purpose. "As we have evolved, we thought it was important to have a name that best represents the agency we are today and one that encompasses our purpose—to advance relationships. We have taken a firm stand for our purpose and our work in advancing relationships between brands and people, and we wanted a name that reflects it." I asked for an example of the sort of work MEplusYOU is doing that demonstrates how marketing is done in the Relationship Era. Levy pointed to the World Series Bat Drop, a program for Louisville Slugger, whose purpose is to "make players great." The agency used digital and experiential approaches to deepen the connection between the brand and its fans. The Louisville Slugger World Series Bat Drop took place on the Saturday immediately following the 2011 World Series victory by the St. Louis Cardinals. Armed with an SUV, a few iPhones and 45 commemorative Louisville Slugger World Series bats, a team of MEplusYOU staffers took to the streets and dropped each of the bats in secret locations across the greater St. Louis metropolitan area. As each bat was “dropped,” the crew posted clues (including riddles, trivia and pictures from the bat’s perspective) to the Louisville Slugger Facebook and Twitter pages. St. Louis residents spent hours in their cars, crisscrossing the city, camping out at popular tourist destinations and following the “bat drop” SUV. Facebook fans not able to physically “hunt” offered virtual support by helping to solve riddles and identify locations for hunters. Fans posted pictures with their commemorative bats, messages to one another about the brand and answers to clues to Louisville Slugger’s social media channels. The results: Over the course of eight hours, the Louisville Slugger fan base increased by 143%; the Twitter fan base increased by 163%; and the new Facebook metric, “talking about this,” increased by 834%. Asked to sum up the agency's rebranding, Levy noted, "We exist to advance relationships. We have discovered that effective marketing starts with introspection and clarity of beliefs and purpose--the ME part. From that place of clarity, brands are ready to build authentic relationships with people--the plusYOU part." Hard to argue with the logic of focusing on building relationships and not just messages in today's world. I wish MEplusYOU luck with their new name and old focus on helping their clients succeed in the Relationship Era.